Thursday we left Santa Margherita and sailed out the harbour to pass several hours and 20 miles to reach some of the most amazing villages we have seen from the water. 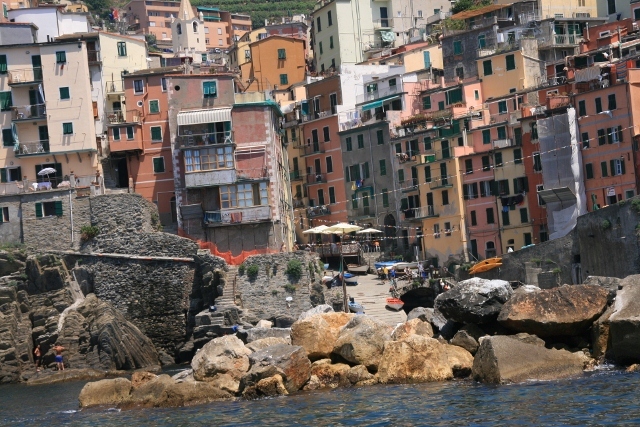 Cinque Terre is an Italian National Park and spans through 5 villages: Monterosso, Vernazza, Corniglia, Manarola and Riomaggiore. The villages were accessible only by boat for many years and so have been protected and have remained unchanged over centuries. We would slow down as we came to a village and get as close as we could to the rocky shore, take a few photos and then go onto to the next. 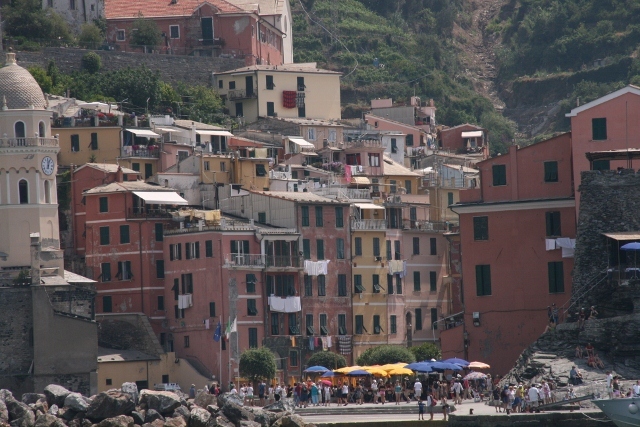 At Vernazza, we stopped and had lunch and then a swim in the 26C degree water. 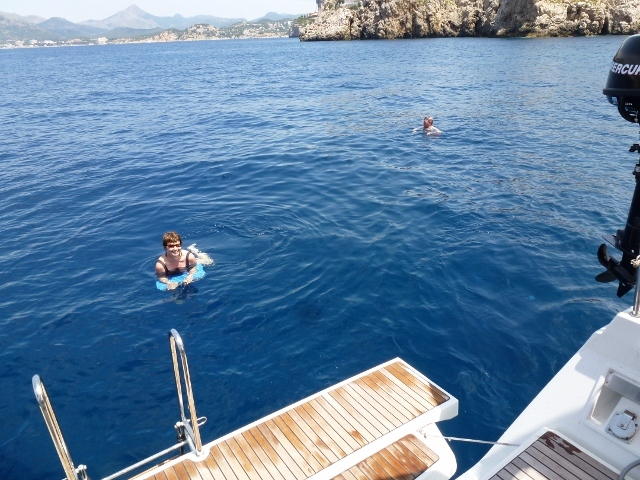 Mercier is the best yacht we have been on for having a quick or a leisurely swim off the stern. 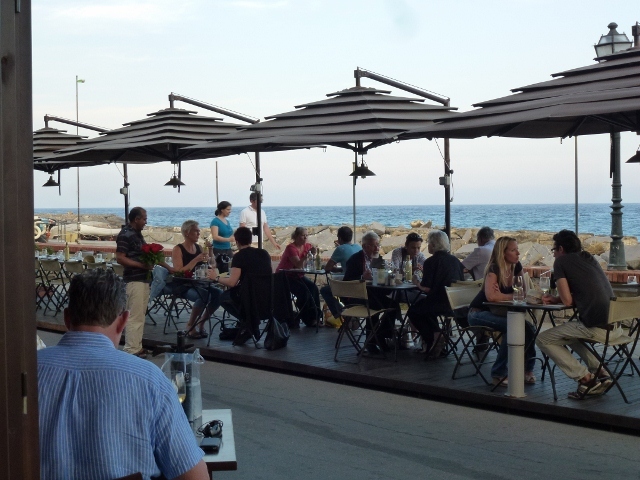 On Thursday night we went to the best restaurant in town where normally bookings are mandatory, however, the restaurant was almost deserted as Italy was playing Germany in the semi final of the Euro Cup 2012. It was quite obvious who the winners were, with car and ship horns blaring at full time. On Friday we visited each of the villages by land and each one has a different look and feel, with most of them having gardens and vineyards going up the hills behind them in terraces. Pastel houses on verdant hills against bright blue water and sheer slate grey cliffs. 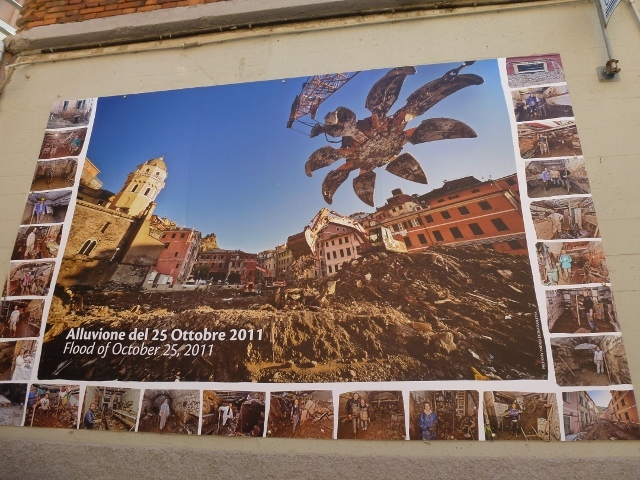 Two of the villages had massive damage on the 25th October 2012, when flood waters from the steep hills behind coursed straight thru buildings and into the sea. 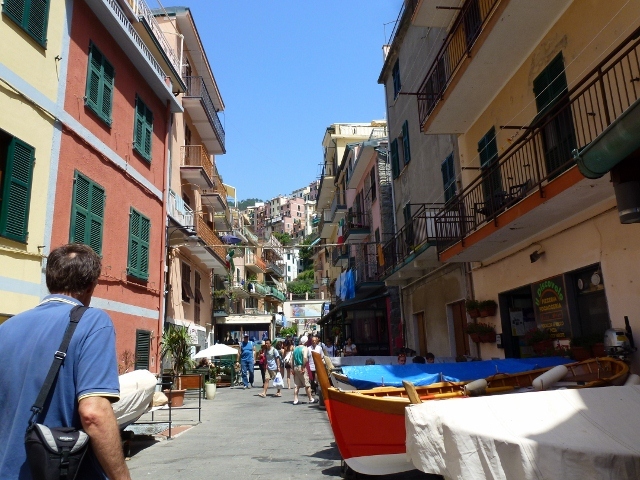 Some of the trails are still are closed, but the resilience of the people of the Cinque Terre shines through and many businesses are rebuilding or back to normal. 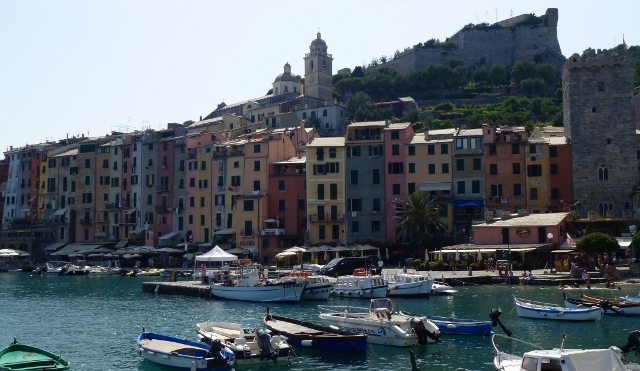 We finished the day’s travels at Porto Venere – another town nearby with lots of history. The town flag is the flag of St George (the English flag). PS: Happy Birthday to Matt and Adelaide, whose grandparents might be reading this and pass them our birthday greetings. 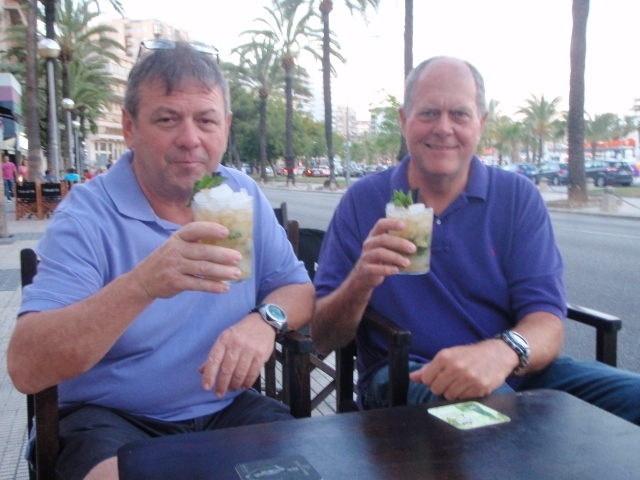 Also Simon Jenkins and Ivan Wheen, we had a little drink to you on your birthdays. Hope you had great days. 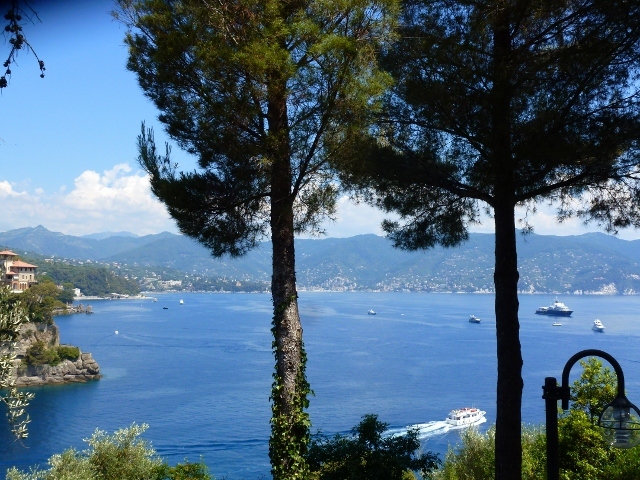 We decided to head directly to Portofino from Imperia, a full 8 hour motor sail, with the main up and the genoa rolled in and out 3 times due to wind variations, still it was very pleasant. The trip was punctuated when we were almost there, by a whale sighting. We think it was a moderately sized sperm whale, a joy to see in the wild. 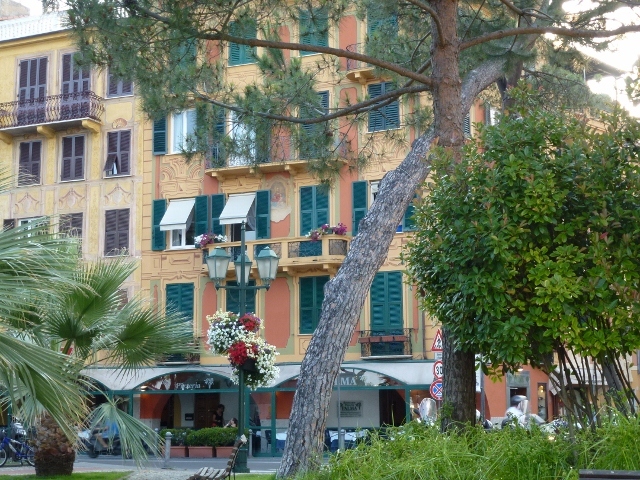 We arrived at Portofino around 4pm, but decided to stay in the neighbouring harbour of Saint Margherita Ligure which is far more protected from the sea and it’s swell. 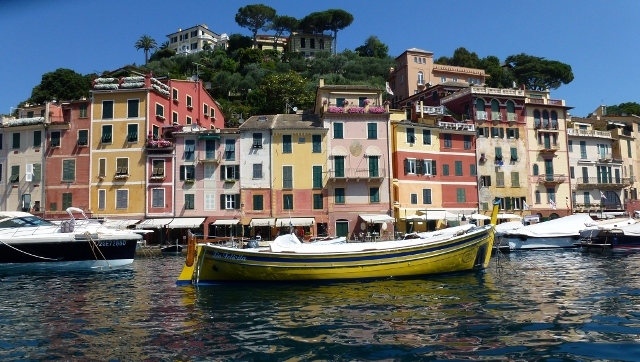 This morning we made the trip back to Portofino in the Zodiac and really enjoyed the town. We hiked up the hill to the church and castle, with spectacular vistas on the way. 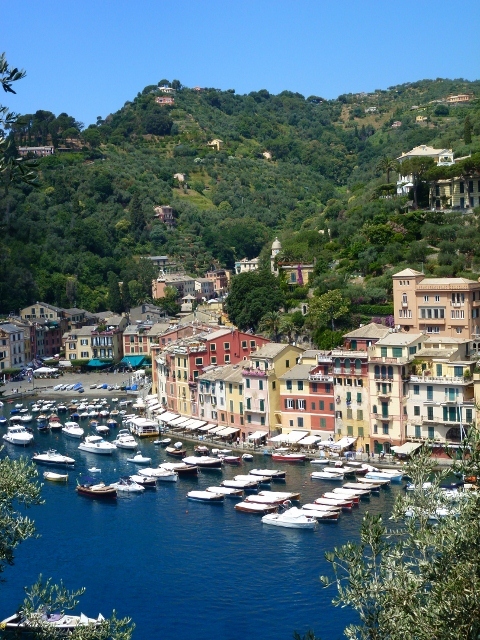 Portofino is a small but perfect jewel. We enjoyed the Italian vista with slender pines, gums and shrubs. Very green with pastel houses of lemon, pink, tangerine going up the hills around the harbour. The small local boats were all brightly coloured with deep reds, yellows, blues and greens. Last night we sat on the bow of the boat, in the breeze, looking at Santa Margherita, shining with lights and church bells pealing, we were so happy to be able to enjoy this part of beautiful Italy. Success today, so we are sitting on a rocky shore, inches from the water with a balmy sea breeze and a feeling of relief. Relief that comes from spending the entire morning with lovely Italian customs and having completed all the formalities, & having all the correct paperwork in our hands. We feel like students that have received the coveted gold star. Va bene! 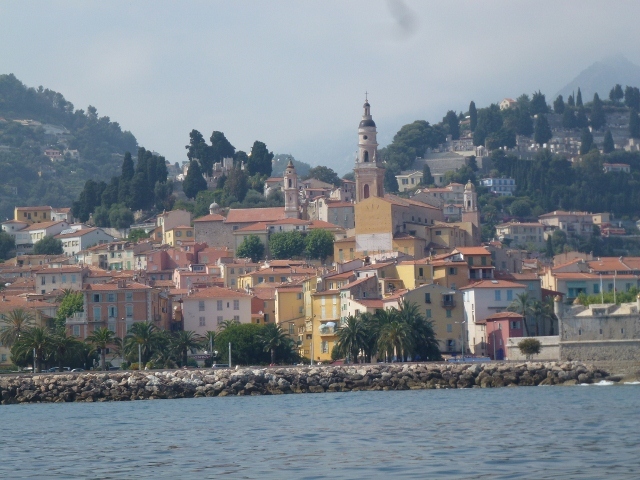 We departed Menton on Saturday morning and motored twelve miles to Sanremo. It was a picturesque coastline and lovely on the water. We moored amongst the huge motor yachts at Porto Sole. We went for a walk and thought since it was Saturday afternoon and all the shops were locked up, it would make for a very quiet weekend. We strolled on looking for the lone gelato shop that might be open and stumbled onto Via Matteotti. 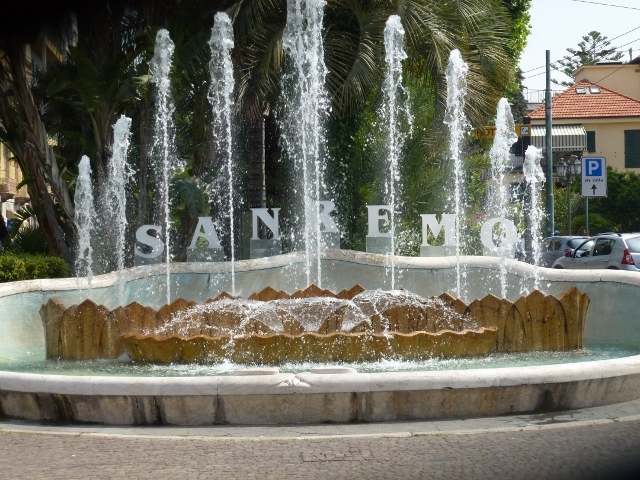 We were in the lively quarter of San Remo and far from being a deserted town, we got the last table at Caffe Ducale and sat and watched San Remo go by.The activity was amazing and at least three generations were taking part. Sunday morning, we explored the old part of San Remo called La Pigna with the obligatory hundreds of stairs, but the view from the hill was spectacular. 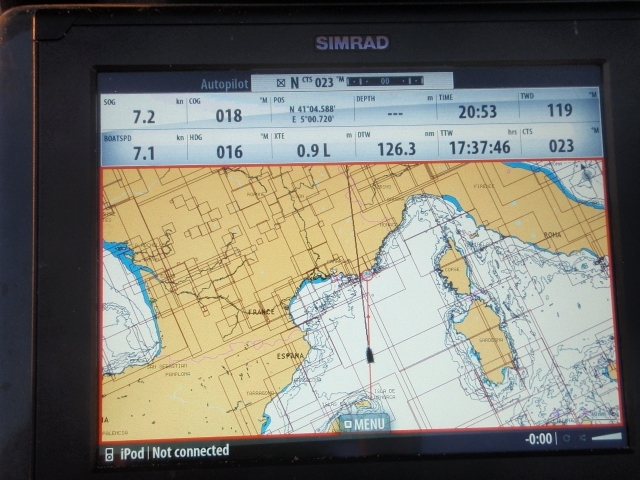 We then set sail for Imperia, had a very pleasant motor sail, again 12 miles. We arrived at Imperia about 1.30, and decided that as it was Sunday, the port would probably be closed for lunch. 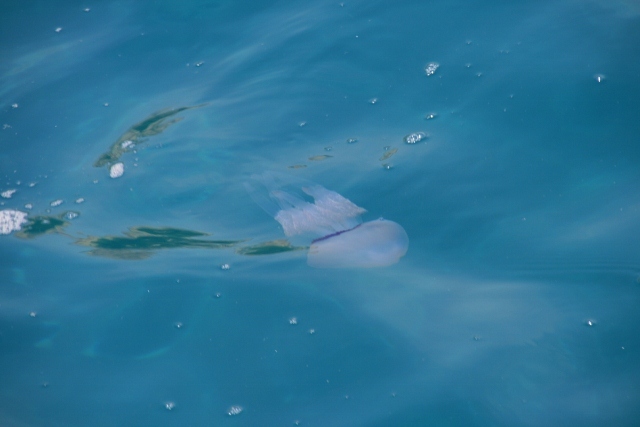 We anchored for a swim in the 25 degree water, very refreshing until a jellyfish swam right by, James made a quick exit from the water and waited until all was clear until returning. 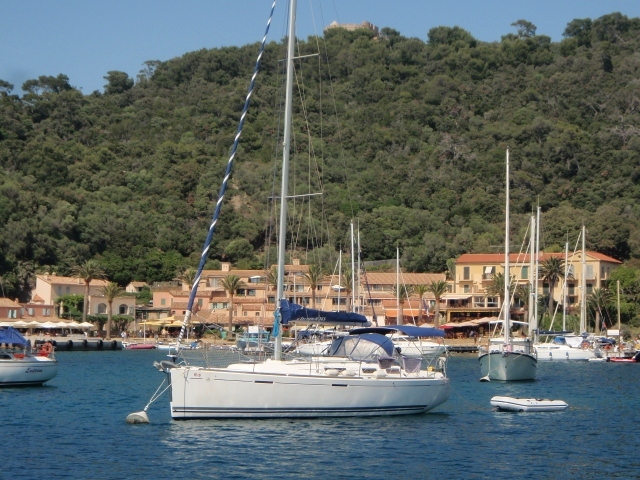 We then found a berth in the harbour, and went to the office and were advised that the annual feast of Sant Giovanni was going to take place in the adjoining town of Oneglia with fireworks later. We found ourselves in the square in front of the church where the parade of the Feast was getting prepared, with lots of colour, pomp & ceremony (and lots of statues being carried aloft). There were some firework explosions around 7.30 in the daylight, but we thought that would be it. But we were awoken from our slumbers at 11.30, with a full display. Monday we accomplished the formalities described above, but arrived back at the boat to find quite a strong wind blowing and that the boat had scraped the dock a little. Someone had come aboard, attached an extra bow line, and put an extra fender on the stern in our absence. (Thank you to our good samaritan) We were planning to move on to a new port, but the wind was coming from the direction we intended to travel, so once again our plans are modified by Huey. Our gain, because Trip Advisor told us there was an utterly perfect restaurant – Nero Di Seppia, just over a kilometer away. We are off to dinner. Ciao Bella! The last two days have been fervid, from a great dinner Wednesday night in Suquet, the old quarter of Cannes. We dined at Le Marais, which was worth the walk up the hill past all the other restaurants and cafes. 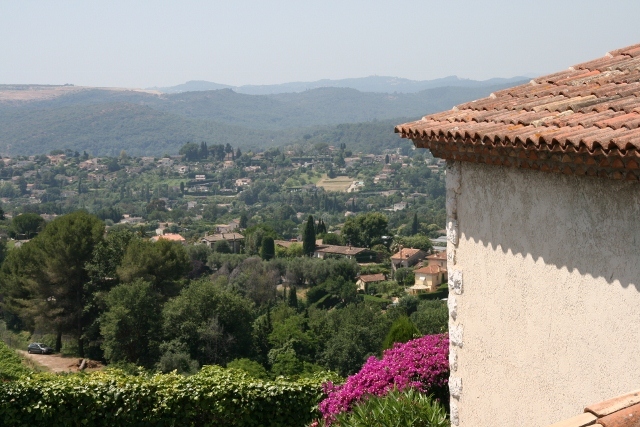 Yesterday, we decided to visit the hills and drove to Vence, had a coffee, then strolled through the Old Town and drove down the hill to St Paul de Vence for a lovely lunch of fish soup and salad. The views and strolls through this old town are remarkable and next time I hope we stay for a night and see St Paul de Vence under the stars. 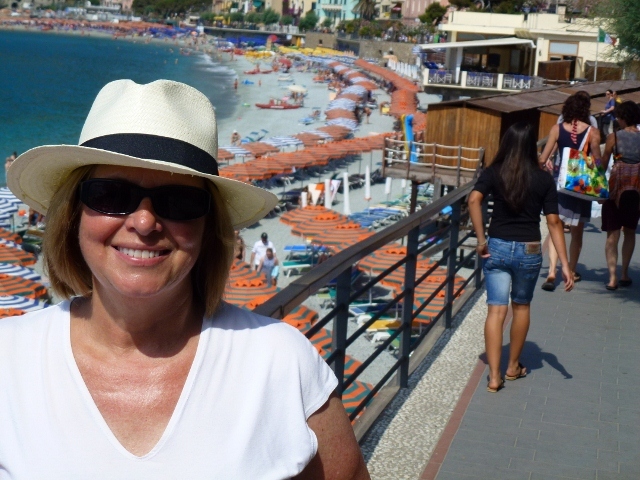 We drove to Nice and motored down the Promenade des Anglais to the Cours Saleya. We walked around the markets. A few flower stalls were still full of peonies, lavender and lillies, while the restaurants and cafes were busily setting up for dinner. Time to leave for the airport, we dropped Rene and Richard off for their UK flight and drove back to Cannes. The traffic in Cannes was so heavy, they might have arrived first. PS We asked them not to go, but they were steadfast and the text from Cowes today was ” Blowing a Gale in Cowes”. Mercier had amazing a lovely motor sail under blue skies to beautiful Menton, Views of Cap Ferrat and Monaco were stunning and the water temperature is 24°C. 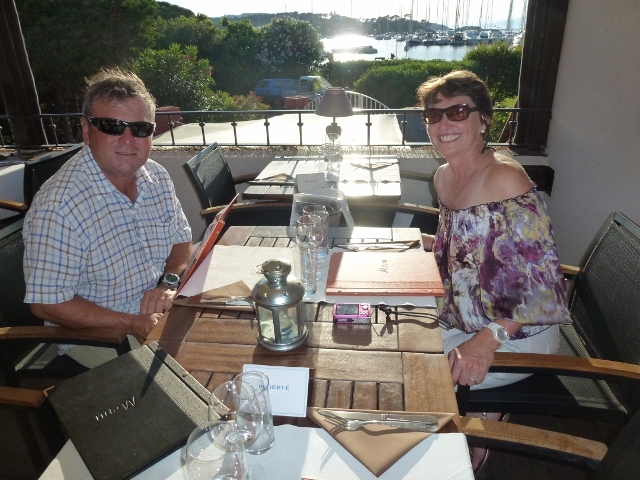 We motored across from Porquerolles to Ile de Port Cros, heading ever westward. Ile de Port Cros is a National Park, with a tiny village. The island is sanctuary for marine life including sea weed, sea gulls and fish. The seagulls are enormous. The fish are curious and large. They swim safely up to you safely in the knowledge, that there are no hooks or spears allowed. The island is small with five forts, several cafes on the beach front and water so clear that you can see every fish and the bottom with its seaweed cover. My head knew I was in Provence, but my heart was telling me I was near an old fishing village in Mexico, even in June the trails are dusty but the native foliage is dotted with plants you would see in Mazatlan. 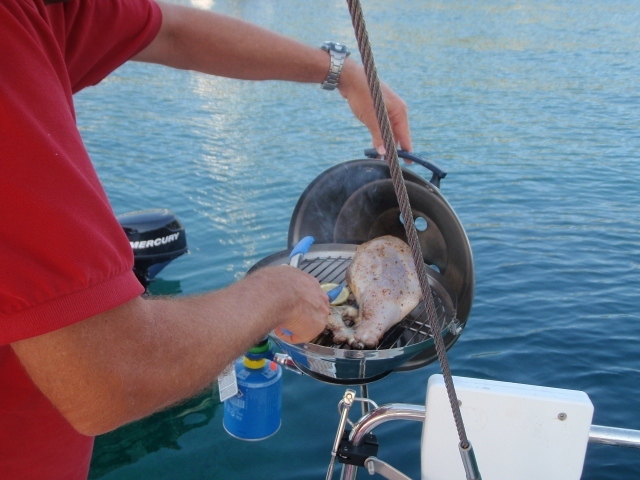 While we were there we christened our new BBQ with a lamb roast and it was most enjoyable. The bay filled with boats in the evening and before sunset every mooring was taken and a few yachts had to anchor outside the protected area. 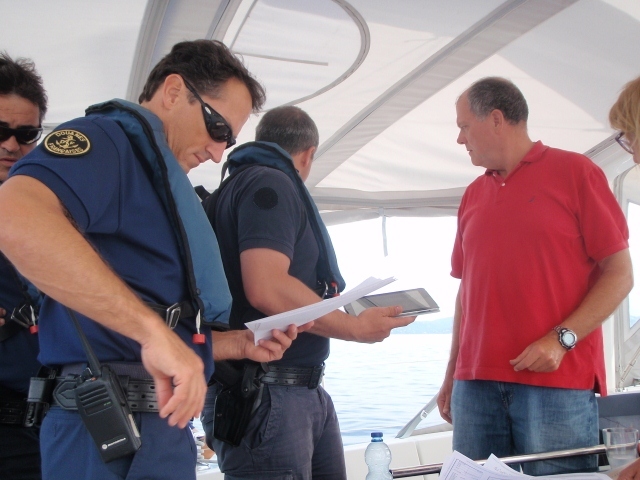 In the morning we were up early and motoring over to St Tropez, the wind was too light to put up even a gib. In the distance, Blue could see a Customs Boat and when they saw us, a boarding party jumped into their dinghy and came over. 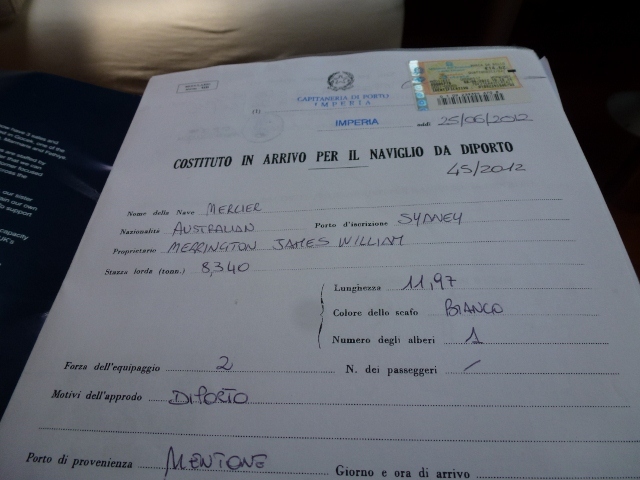 The Douane checked all of our papers, asked many questions, luckily we have an email from the Australian Shipping Registration Office, showing that we are registering the boat in Australia, but we don’t have the paperwork yet. They checked all of our passports and finally sent us on our way. They wanted our email in print, we hope the paperwork arrives for us soon. 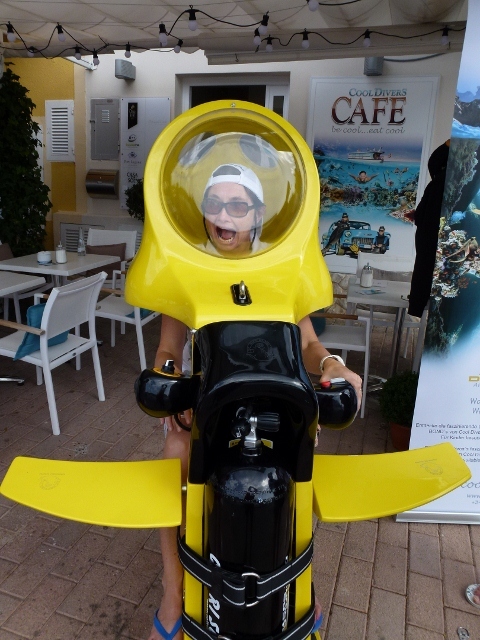 St Tropez was warm, full of tourists and it is only June. We had a large salad lunch in a back lane cafe and then strolled through the town streets, eventually Rene and Gaila broke off to do a little shopping, James found his way to a ship chandler and Blue went scouting for the evening’s repast. 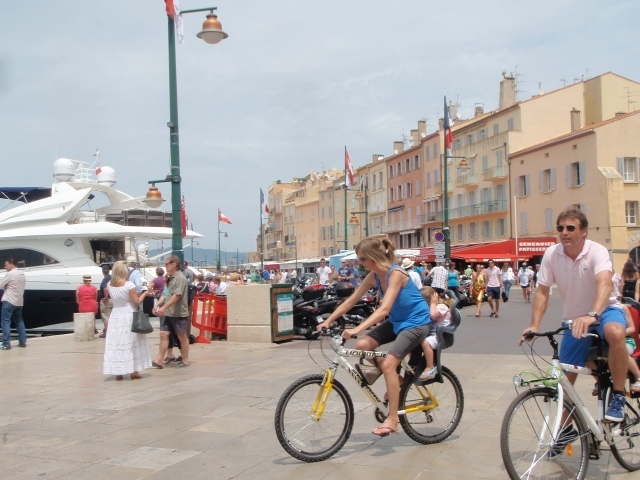 St Tropez was filled with about 20 super yachts, so we feel quite humble here. 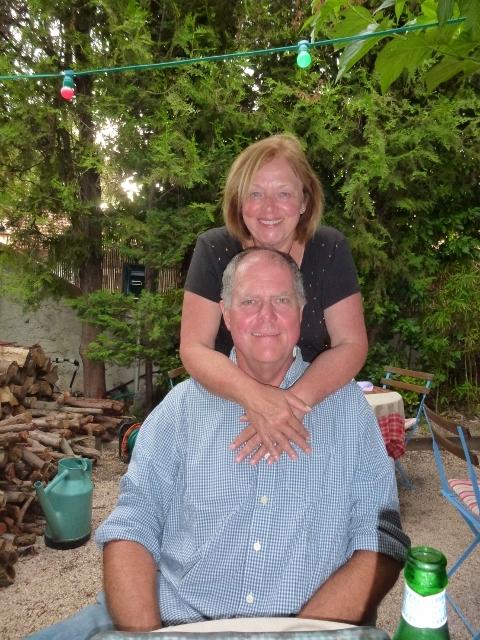 We had dinner at La Ramade and we were charmed by the tree covered patio and the traditional Provence food. 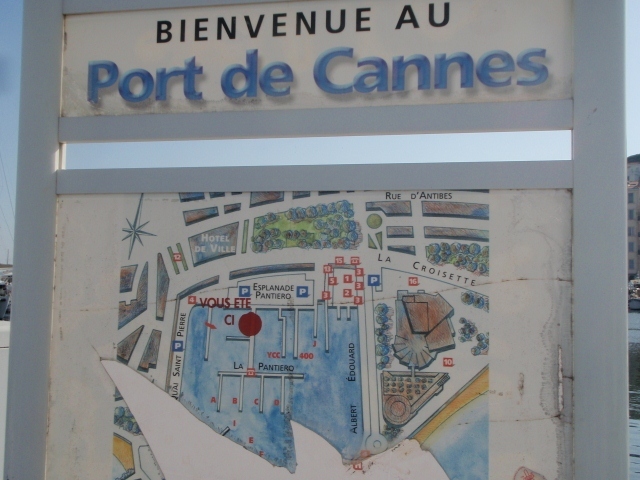 This morning, we are on our way to Cannes, getting closer to Nice Airport and Blue and Rene’s flight to England. It isn’t always easy to find access to internet connections. We will all be scurrying around when we first reach port, trying to ask for an Internet café in a different language than the day before. And when you are out at sea, there is no hope of internet. Occasionally, you are having so much fun, you don’t want to look at a computer. This past week we have had all of these scenarios, so that’s why this is the first blog in awhile. 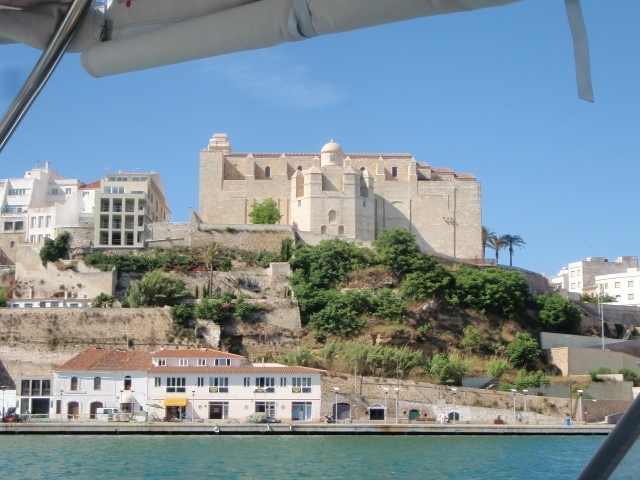 After we left Ciutadella, we sailed to the North of Menorca and moored in Fornells. We decided we would stay on the boat because we had no hope of arriving on land with dry clothes due to a strong breeze in the harbour. Instead we opened a bottle or two of Spanish wine, James cooked Salmon fillets and we sat on the deck under the Menorcan sky. 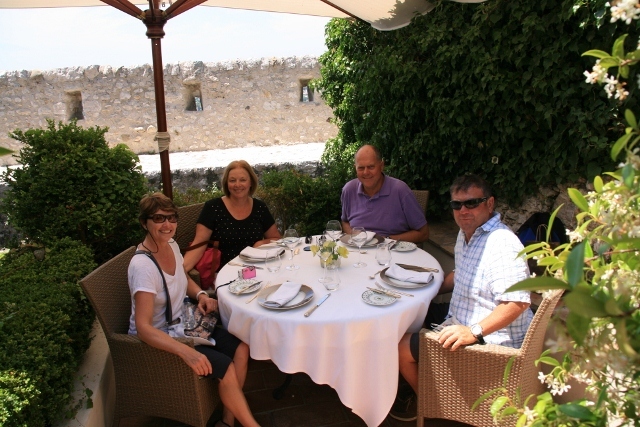 The next day we sailed to Mahon and wandered the streets, which closed completely at lunch time. James and Gaila went off the markets, which were in an old building and had several fruit & vegetable mongers and sellers of Menorcan goods. That night found us in Es Castell eating at a traditional Menorcan restaurant called Dinkums (Dual Income No Kids Under Menorcan Skies). Our table was six inches from the waterfront, so we were able to feed the fish while waiting for our mains. Note: Menorcan fish love bread, but they are very smart so they didn’t touch a French fry. We walked back up the hill to the taxi rank and here was a shop for traditional Menorcan sandals. Even James and Blue bought a pair, so we hope to come back to Sydney and start a trend. Early the next morning, we finished preparing the boat for the crossing to France, a trip of about 30 hours in the light conditions we experienced. The seas were calm and the day was sunny and warm, very different that the trip down to Palma. We thanked Huey and sailed to France. 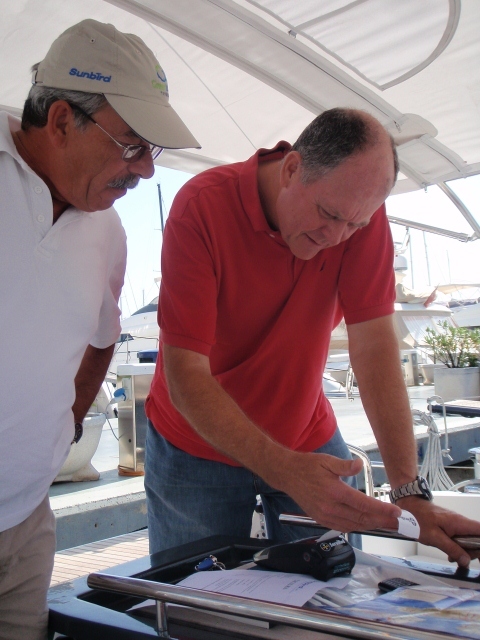 We landed in Hyeres late Saturday afternoon, too late for the Orange store to buy Internet time but in plenty of time to do the shopping – several great ship chandlers here, we found a bbq and a salad bowl. One of the great treats of Hyeres is a self service Laundromat. One seems to meet the nicest people doing laundry. 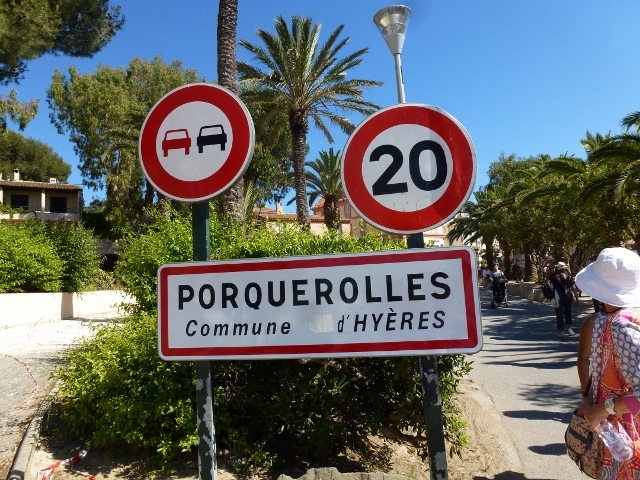 They are usually French and staying in one of the many holiday rentals in Hyeres. 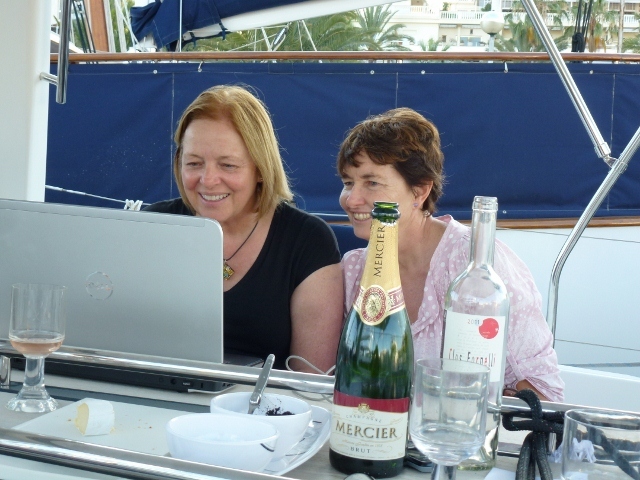 We did look for an internet café at the port, but we weren’t successful, so Rene and Gaila had to wait to the next afternoon for WeeFee. 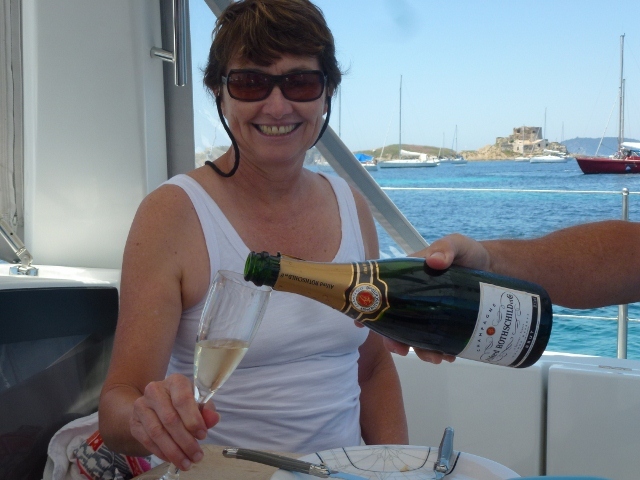 We had a celebratory lunch on Mercier for Rene with some lovely champagne from Epernay in the Bay of Langoustine. 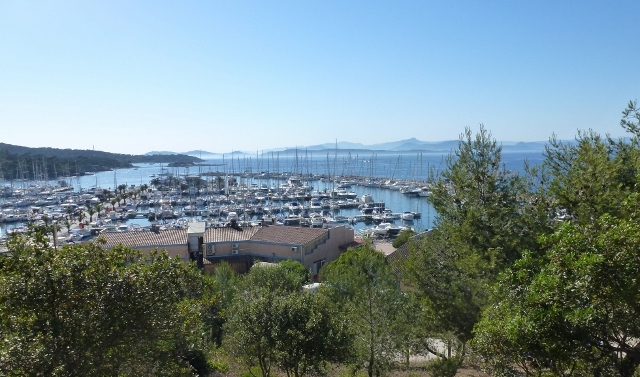 Later in the afternoon we motored over to Port Porquerolles and wandered around this interesting town, where mountain bike rental is a thriving industry. The evening commenced with a bottle of well chilled Moet on Mercier, before the lovely dockside walk into town for dinner on the verandah of the lovely L’Orangeraie. We watched the sun set over a hundred masts. 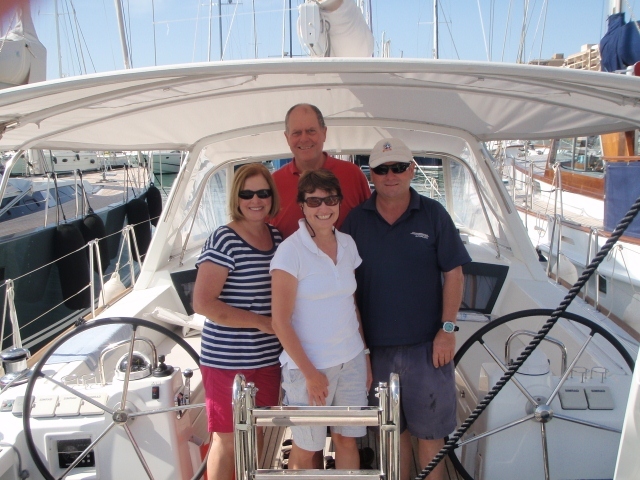 Not all our adventures are on the water, on Monday we motored from Formentor to Port Pollenca and found a berth at Club Nautico. 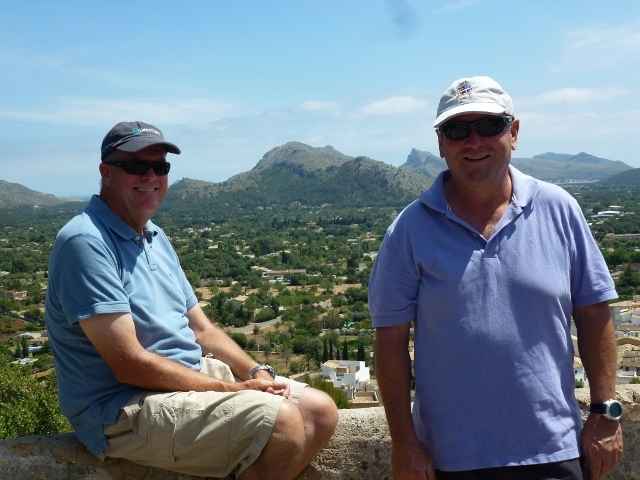 After running a few errands, we jumped in a cab and went to the old town of Pollenca. 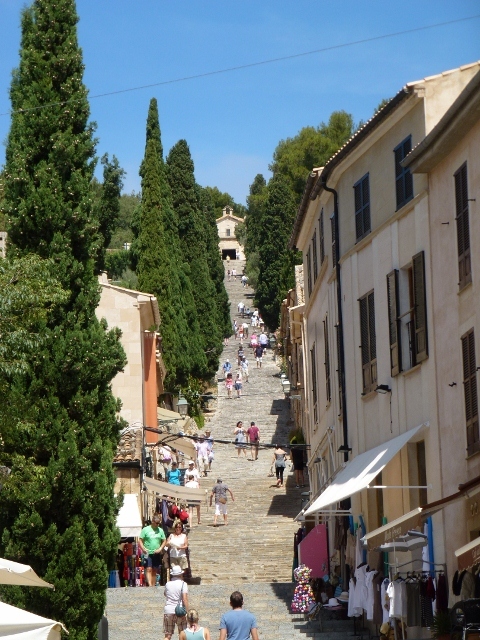 We won’t forget Pollenca, because of the enduring memory of climbing up and down, her 365 steps up to the Inglesia Calvari. We have been doing a lot of walking, mainly on flat avenues and laneways but this was steep. The views over the town were worth it and made the tapas we found on our descent, even more delicious. 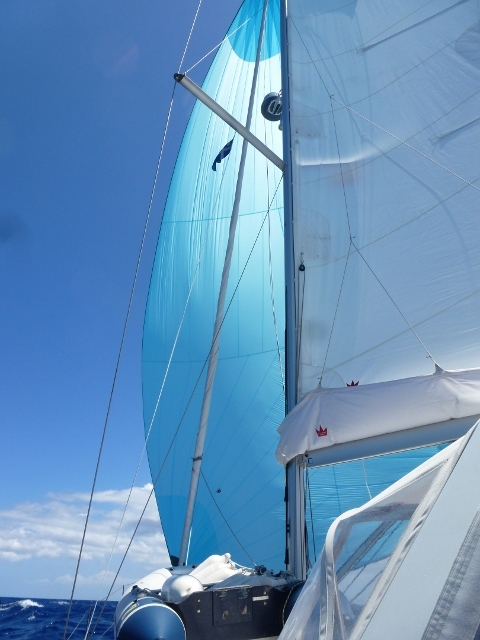 Tuesday we sailed to Menorca, we started out with little wind, but once we were out of the bay of Pollenca, the wind freshened to about 15 to 20 knots and the boys decided it was time to get out the asymmetrical spinnaker. Blue did a splendid job on the bow and Mercier clearly loved the run under sail. What looked like a boring four hours under motor turned into an enjoyable sail. Approaching the island, you immediately notice the difference in the coastline. Mallorca was sheers cliffs driving straight out of the water. Menorca is like a flat plain above it. 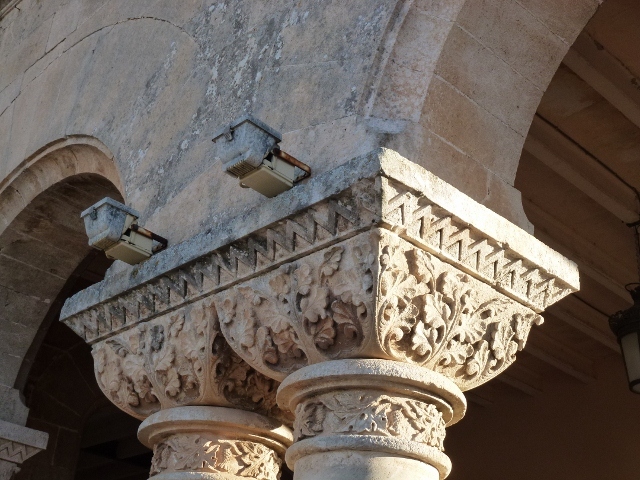 We arrived in Ciutdella, a beautiful old Medieval city, with influences from the Moors, Spanish and English. 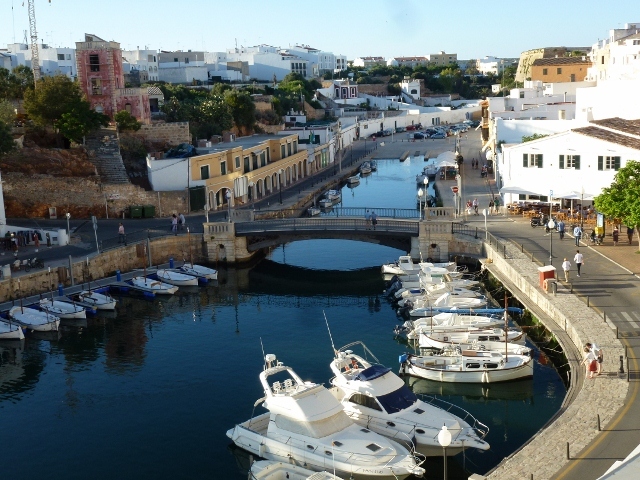 There is a beautiful bridge near the Port and wonderful streets for our endless strolls. Time to get moving, so enjoy the pictures. There are three types of wind in the Med, according to folklore and local knowledge: Too much wind, too little wind and wind coming directly from where you would like to go. We have decided that this local knowledge is truth, pure and simple. We had to wait for days to leave France to sail to Palma. We have seen a couple of days where it wasn’t worthwhile putting up the sails, because there wasn’t any breeze. 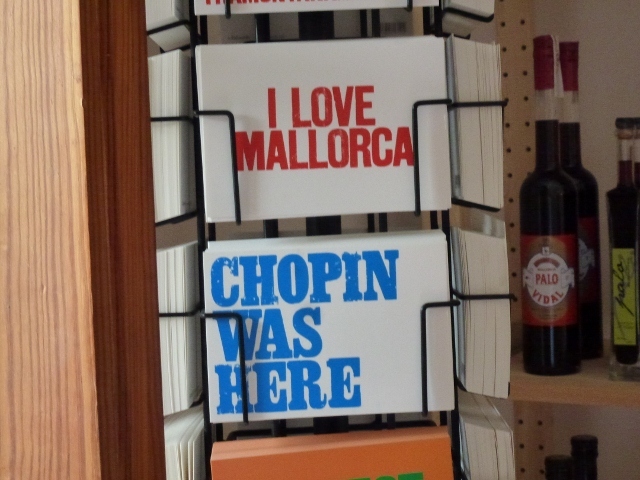 On Thursday we managed to get to Soller, but Friday had us leaving for Andratx and it was dead on the nose. At this point the question begins to be, do we want to slog away in this wind for four hours or will we just sail back to Andratx and enjoy Rossini’s tuna carpaccio? 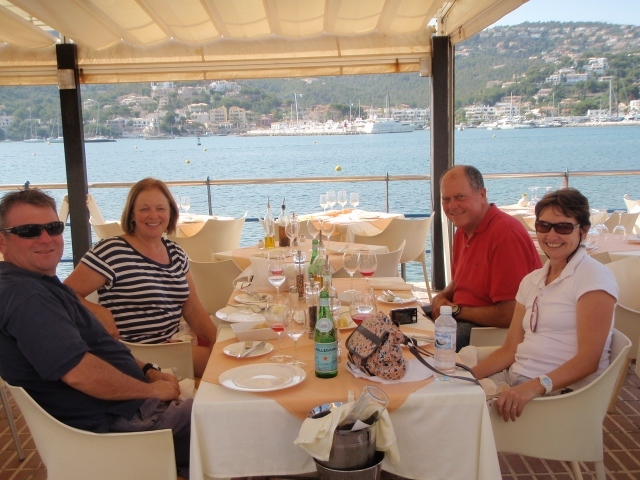 No prizes for guessing, we went around the Islla de Dragonera and into a cove near Andratx and made a lovely lunch. After a short but chilly swim, we attempted sailing to Soller once again, but in the end, we went back to Andratx. For those of you who remember, we didn’t see Christopher Skase here, he did have developments in Andratx but they never came to fruition. Saturday morning, there was no wind, so we cruised under motor to Port Soller and upon arriving Rene and Gaila took the electric tram to old Soller town and wandered around lanes and plazas looking at the architecture and generally people watching. 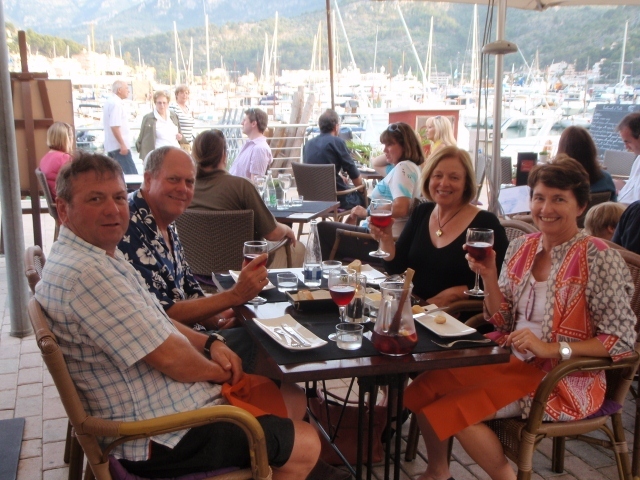 The four of us went to a Port Soller waterfront cafe and had a sumptuous dinner of paella and sangria. Sunday morning, sunny skies beckoned us to the Torrent de Pareis, a beautiful bay with a sandy white beach. 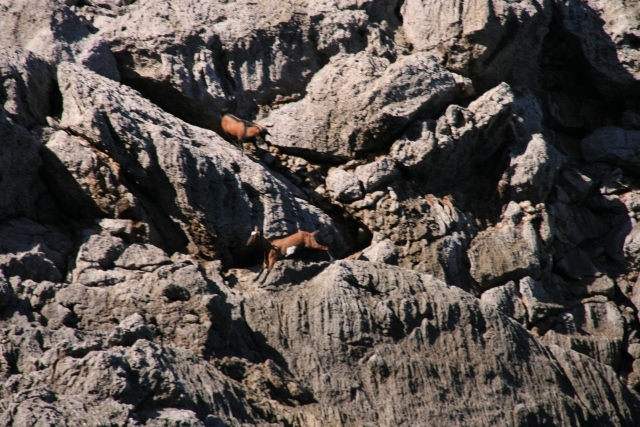 Rene spotted two wild Mallorcan mountain goats, a shy doe and a rather amourous boc (male). The doe was clever, backing into small cave like openings or jumping quickly with great agility, escaping his designs. All of this over a bay of clear aqua water and a white sandy beach, under tall cliffs. 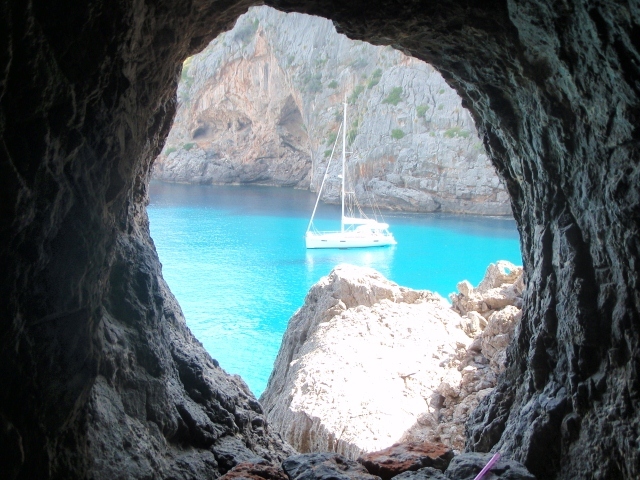 The coastline of western Mallorca is rugged with spectacular cliffs rising straight from the ocean. 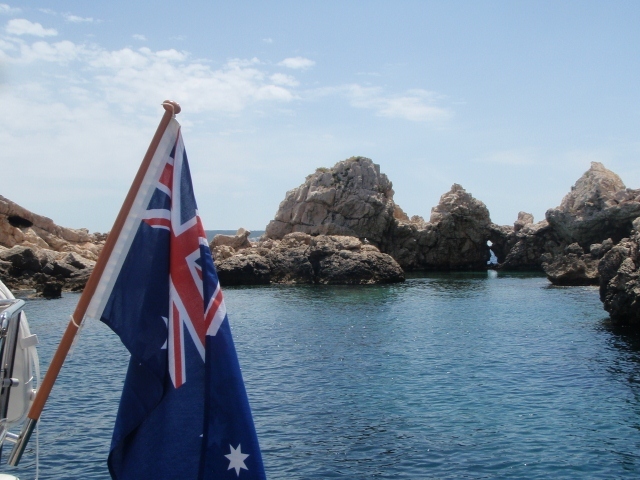 Following the Treleaven recipe of enjoying the Med, we stop for lunch in a beautiful bay and in the afternoon make our way to the next overnight anchorage. Sunday’s anchorage is Formentor and it is postcard perfect. Here is a message from Rene and some photos, we miss you all and wonder why you aren’t here. Hi everyone, well here we are in paradise beautiful Azure blue water and silky white sand, the boat and tender are performing beautifully, the west coast is certainly different from the east…. 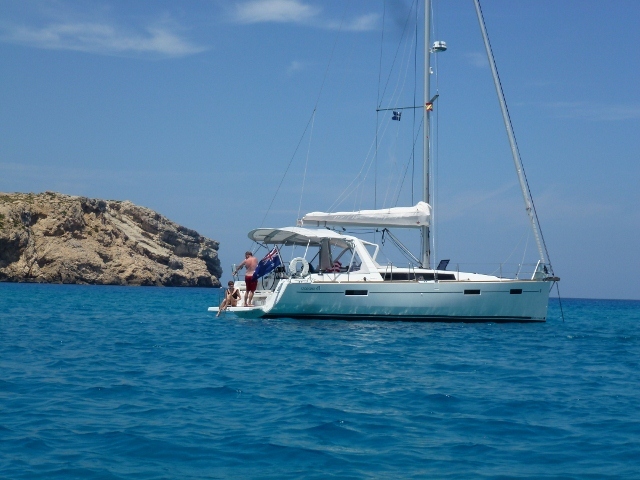 we are heading to Menorca tomorrow and maybe catch up with David ! !